UPDATED: Fri., Aug. 3, 2018, 12:59 p.m.
Two Spokane-area representatives were named to a group trying to develop rules for records the Legislature long believed could be kept private but a judge has ruled should be open to the public. Reps. Matt Shea, of Spokane Valley, and Mike Volz, of Spokane, are the House Republican Caucus choices to sit on a Public Records Act task force. That group is part of a compromise that followed a contentious few days in February during which legislators passed a controversial bill to exempt themselves from parts of the state Public Records Act, but many later asked Gov. Jay Inslee to veto it. The compromise was announced along with the veto. Shea and Volz both voted for that bill. Shea – a sometime critic of the news media – was one of two House members who spoke in favor of it during an unusual legislative process that took less than an hour for the bill to pass both chambers. 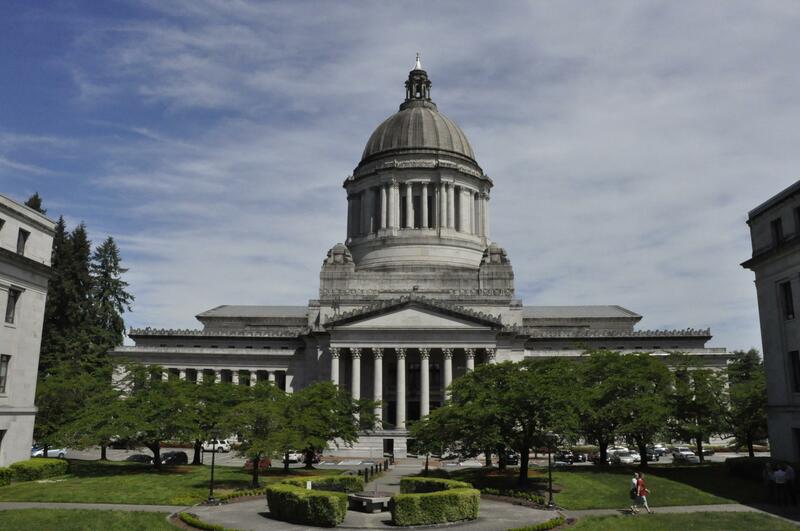 The bill was roundly criticized by the state’s news media, with rare front-page editorials in many Washington newspapers. Shea accused opponents of the bill of having “for-profit” motives. Republican and Democratic caucuses in the House and Senate each selected two members to the task force, which also has three members representing the news media, three representing the general public and a longtime advocate for open government. Shea and Volz are the only members from the Spokane area. The final approval of members and a schedule for meetings is expected to be released next week, with recommendations due in December. The task force was part of an agreement between the Legislature and the news media after lawmakers lost a court fight over an exemption they had long claimed from the state’s Public Records Act. A coalition of news organizations, led by the Associated Press and including The Spokesman-Review, sued after reporters’ requests for documents sent to all 147 legislators and their leaders were mostly denied. The requested records included calendar entries, text messages related to legislative duties and complaints and investigative reports about claims of improper conduct. Although a few lawmakers released calendar information and texts, most refused to release anything. They claimed they were exempt from the Public Records Act initially approved by voters because of amendments the Legislature made in 1995, 2005 and 2007. Thurston County Superior Court Chris Lanese ruled in January, however, that individual lawmakers’ offices can’t keep those records secret. The case was appealed to the state Supreme Court, but in late February, the Legislature moved with record speed to change the law and make some of its records public while creating broad exemptions to keep others secret. A bill was introduced and came to the Senate floor one day after it was announced. It had no hearing, and only supporters spoke in favor of it before the vote. It passed 41-7, then moved to the House about 20 minutes later where Shea urged members to vote yes. He said the Legislature was at its most transparent and open time in history and criticized Lanese’s decision and the news media that was seeking legislative records. “We are having to respond to a court twisting the plain meaning of the law,” Shea said. “We are a separate branch of government and this bill, very clearly, restores the separation of powers. House Minority Leader J.T. Wilcox, of Yelm, said Shea was selected because he’s a member of leadership and one of its members who is an attorney. Volz, who is also chief deputy treasurer for Spokane County, was chosen because of his long experience in local government. The concerns revolve around protecting the identity of whistleblowers and others who contact members with private concerns, Wilcox said. House Democrats also selected two members who had experience in local government, which regularly deals with public records requests, spokesman Jim Richards said. Senate Democrats selected members who did not have passionate views one way or another and who weren’t up for re-election this year, spokesman Aaron Wasser said. Senate Republican Leader Mark Schoesler, of Ritzville, selected two veteran legislators “and both were happy to do it,” spokeswoman Kimberly Wirtz said. After the bill passed, it was signed and sent to the governor all on the same day, something that rarely happens except in cases where a budget is needed to avert a state government shutdown. Gov. Jay Inslee had criticized the bill but said he might not veto it if it had a veto-proof majority. The Legislature and news organizations said they would try resolving the dispute and agreed to a stay of Lanese’s order and to work together on a task force to resolve their differences, said Michele Earl-Hubbard, the attorney representing the news organizations. Inslee vetoed the bill March 1. The Legislature adjourned on March 8 and appointments to the task force have been made in the interim. It is expected to hold meetings through December before making its report. Published: Aug. 3, 2018, midnight Updated: Aug. 3, 2018, 12:59 p.m.